Although ceramic-on-ceramic bearings for total hip arthroplasty (THA) show promising results in terms of bearing-surface wear, fracture of the bearing, insertional chips, and squeaking remain a concern. Our primary objective of this report was to determine overall survivorship of a titanium-encased ceramic-on-ceramic bearing couple. Our secondary objectives were to evaluate for ceramic fracture, insertional chips, osteolysis, and device squeaking. Six surgeons at six institutions implanted 194 patients (209 hips) with an average age of 52 years with cementless hips and alumina ceramic bearings. One hundred thirty-seven patients (146 hips) have 10-year followup (70%). We determined Kaplan-Meier survivorship of the bearing surface and implant system and collected radiographic and clinical data to evaluate for osteolysis and squeaking. Survivorship using revision for any reason as the end point was 97% at 10 years and survivorship end point bearing surface failure or aseptic loosening of 99%. There was one ceramic insert fracture (0.5%), there were no insertional chips, there was no visible osteolysis on AP and lateral radiographs, and there was a 1% patient-self-reported incidence of squeaking at the last clinical followup. Six hips underwent revision (3.7%). Ceramic bearings for THA with a titanium-encased insert have high survivorship at 10 years followup and a fracture risk of 0.5%. We found at last followup on routine radiographs no evidence of osteolysis, and no patient has been revised for squeaking or has reported dissatisfaction with the clinical result because of noise. One or more of the authors (JAD, WNC) certify that they have or may receive payments or benefits, in any one year, an amount in excess of USD 10,000 from a commercial entity (Stryker Orthopaedics, Mahwah, NJ, USA) related to this work; two authors (JAD, WNC) certify that they have stock in Stryker Orthopaedics. One author (MN) is an employee of Stryker Orthopaedics. This work was performed at Sewickley Valley Hospital Sewickley, PA, USA; Indiana University School of Medicine, Indianapolis, IN, USA; and Stryker Orthopaedics, Mahwah, NJ, USA. 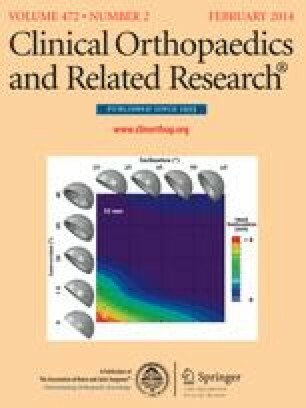 We thank the following investigators and coinvestigators for contributing data on their patients in the Trident study (not including authors): Benjamin E. Bierbaum MD, New England Baptist Hospital (Boston, MA, USA); James R. Roberson MD, Emory Sports Medicine & Spine Center (Decauter, GA, USA); Scott Silverhus, The CORE Institute (Phoenix, AZ, USA); Flower Hospital (Sylvania, OH, USA); and Robert Zann MD, Boca Raton Hospital (Boca Raton, FL, USA).